Owned by Frederic Duncan Mant (b. 12 May, 1835) who served in both the 26th and 77th regiment. On the uniform is displayed the Crimean War medal and clasp. 2. 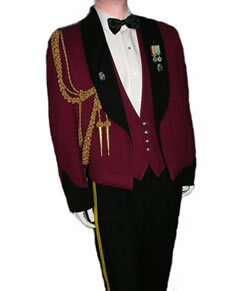 Dress Uniform of Brigadier (rank Lieutenant Colonel) Colin Dunlop Wilson Rankin (1869-1940) worn at his wedding in 1906. Rankin served in both the Boer War and World War I, represented the seat of Burrum in the Legislative Assembly of Queensland, was the Director of Queensland Collieries at Howard and the father of Dame Annabelle Rankin. Depicts an Australian Officer with the rank of Lieutenant. A black and red patch on the upper sleeve shows that his previous unit was the 7th Light Horse Regiment and a larger blue and white patch is his current unit, the 1st Light Horse Regiment. Both these units originated in N.S.W. and served in Gallipoli, Egypt and the Middle East. The puttees around the lower legs and the steel helmet represent an Infantry Officer serving in France or Belgium. 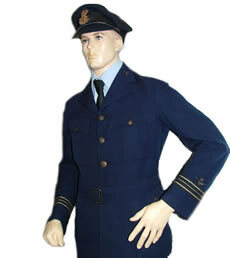 Navy uniform of Ron Bray who served on the H.M.A.S. Manoora in World War 2, standing with a woman from World War 2 Volunteer Aid Detachment (VAD). This uniform was worn by members of the Australian Army during WW2. The shoulder patch and chevrons show that the wearer was a Sergeant of the 47th Battalion, 2nd Australian Imperial Force from the Wide Bay area. This jacket was donated by H.T. (Dudley) Keene who enlisted on 25th September, 1941 and was discharged on 30th December, 1944. Note: The position of the rifle is incorrect and should be on the soldier's back. It was displayed on the front for visitors to easily view the weapon. Worn by Bob Hunter MM, former Mayor of Maryborough.